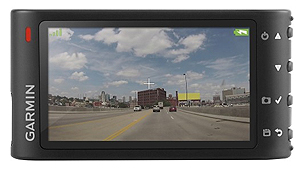 Garmin Dash Cam 35 not only serves as eyewitness for your car drive but it also incorporates several safety features like speed and collision warning. You can use it to take snapshots, record videos and play back the recorded footage. It’s a full HD dashboard camera that records video footage at a resolution of 720 pixels and 1080 pixels, depending upon your setting. Garmin Dash Cam 35 LCD ScreenThe Garmin Dash Cam 35 fits perfectly in one’s palm and has a black colored polycarbonate body with no creaks or flex spots. The lens up front is off-centre and towards the left side of the body, with the ball socket for connecting the windshield bracket to the dashcam. Turning the dashcam to its back we find a 3.0 display for viewing the feed as well as 4 buttons on the right for controlling the dashcam and for accessing the various features of the dashcam. On the left side of the display a red notification light which glows in order to notify the driver of any danger. The left edge of the dashcam contains the mini USB port for powering or synchronizing the dashcam, while the bottom has the micro SD card slot, which accepts cards up to 64 GB with minimum read and write speeds of 4 Megabytes or higher. The dash camera also comes with an extremely small lithium battery which is able to power up the unit independently for a maximum of 30 minutes. Talking purely in terms of build, the Garmin feels well-constructed and can take a beating or two with relative ease. This flagship camera from Garmin is more of a ‘plug and forget’ device that mounts on your vehicle’s windshield and keeps an eagle’s eye on your journey without batting an eyelid. The cam automatically turns on and off along with the engine of the vehicle. The built-in G-sensor automatically detects an incident based upon a sudden impact, which is then recorded and saved by the camera in the memory card. 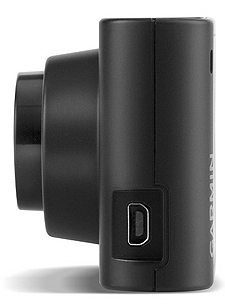 Garmin Dash Cam 35 supports a MicroSD card of up to 64 GB; and a 4 GB MicroSD memory card is included with the camera. Given the fact that you can record an hour-long video in a 4 GB card, and that the camera has a reloop feature, you will hardly feel any need to upgrade the card to higher capacity. Since this dashcam (like many others) saves files in segments, you can lock certain files to be saved for future use/review so that they are not written over in the looping process. The footage quality is good even in low light conditions; you can easily read vehicle number plates. Wide viewing angle ensures that nothing in front of your car goes uncaptured. You can also use this dash cam to take still pictures. This feature allows you to capture close-up shots of damage and wreckage occurring from collisions and other accidents. All you need to do is take out the dash camera from the car and start clicking. Just like video clips, still images too are saved to memory card. The dash cam is also equipped with a GPS receiver; the coordinates of your location are automatically recorded and stored along with the video footage. You can watch the recorded footage right on the camera display, which is a 3 inch TFT LCD screen. And they also have this Dash Cam Player software (that can be downloaded from their site free of cost) if you want to watch the footage on your computer. There are basically 3 types of driver awareness warnings you can get from this dash cam. Forward collision warning alarms you whenever you are unsafely close to a vehicle in front of you. This warning is based upon your current speed. The other two warnings, namely red light warning and speed cameras warning, are subscription based services; they connect your car camera to the Cyclops™ database and alert you whenever there is any red light camera or speed camera nearby. 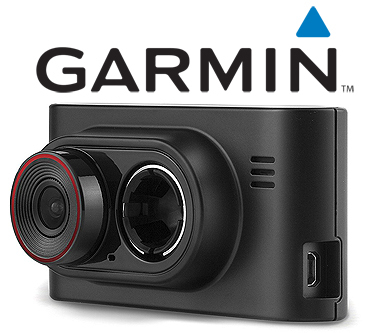 Garmin DashCam 35 uses a Lithium ion battery with an average life of 30 minutes. In Europe, this dashcam has a microphone included with it but the US version is missing the audio recording capability. All in all, the Garmin Dash Cam 35 is a good option if you are looking for a dashcam which can record videos in good quality while coming in a package that seems well made and ready for any adversity thrown at it. A good purchase for first time as well as regular users of dash cams in their cars.